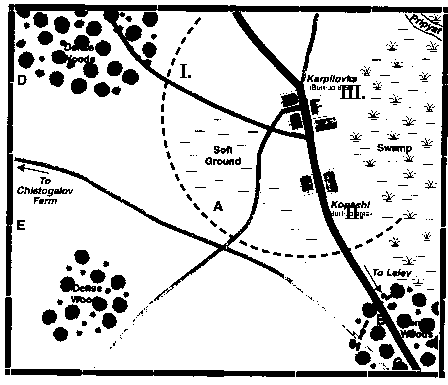 At first glance the Karpilovka scenario looks like a walkover for the Germans. They have a lot of armor, good morale, and Tigers(! ), while all they are up against are infantry and anti-tank guns. Their tanks can overrun and close assault individual infantry stands almost with impunity, and they have a reasonable amount of supporting artillery as well. However, they have a LOT to do in a very short time. The Russians are dug-in, which not only makes them harder to kill, but also harder to see. Also, the discipline rating of the Russian anti-tank guns is Veteran. This gives them a +1 modifier to their fire that makes them dangerous even to Tigers. The Germans must combine caution and audacity. The Russians must deploy their assets to inflict maximum casualties and delay. The initial setup is crucial, as most of the Russians will die where they start. There are some crucial distances you should keep in mind. First, dug-in troops in the open cannot be spotted beyond 5" unless they fire. Second, dug-in medium guns who do not fire cannot be spotted beyond 10" unless they fire, which just happens to be a critical range break for gun effectiveness, where the base weapon rating equals the armor value of the smaller German tanks. An ambush modifier and veteran morale give the Russians a 30% first time chance of knocking out a smaller German tank at this range. The Russians also know where the Germans are going to attack. The soft ground in the middle effectively forces the Germans to come through area I. and area II. on a relatively narrow front. Put your infantry out front covered by your anti-tank guns so that just as the German becomes engaged with your infantry, your anti-tank guns can join the fight. Also, don't forget the anti-tank rifles. Although useless against tanks, they sometimes can attack first and disorder a half-track just before the AT gun attacks it. This can give an extra +1 modifier that can result in another vehicle knocked out. This said, the Russian player must be aware that his units are far from invulnerable and most have a distinct disadvantage in discipline rating. The Russian should make maximum use of dummy markers. If possible, they should commit their SMG units as a last minute reserve to engage the German infantry in the town around area III. They should use their artillery to attempt strip the infantry support from the German armored spearheads, because the tanks cannot easily clear the built-up areas. The anti-tank guns should attempt to use their one-time ambush modifier to maximum advantage. Remember that every vehicle knocked out adds a victory point, and every turn that you keep the Germans out of Karpilovka (the town near area III) is another victory point. If the German exposes the poorly armored halftracks, take them out. They must come to you. The Germans are forced to immediately go on the offensive. Their first priority is to neutralize the Russian anti-tank guns without exposing themselves too much. A viable tactic is to use bounding movement where some units fire while others move forward. Another trick is to move one impulse and then attempt to go hull-down in the second for the extra defensive modifier. While hull-down does not count for enemy troops within 5, you often will be able to go into hull-down positions relative to the AT guns while being within spotting distance of the front line infantry. While moving up, you can put your half-tracks behind a screen of tanks. The tanks are much less likely to be knocked out and you can sometimes close without taking too much damage. Don't be afraid of doing overruns with your tanks. This will automatically suppress a dug-in overrun troop unit and your second echelon troops can then dismount into close combat to finish it off. Your use of artillery is crucial. You have a fair number of company mortars and a 120mm mortar platoon which can fire two patterns independently. Emplace our mortars your mortars where they have a clear line of sight, they can then fire without needing an observer. Also remember that the command tank has the crucial responsibility of calling fire, and keep it safe. Until the Russian opens fire or you move close, you may only choose prominent terrain features as targets. Once you have a suspected target, you can rain down indirect fire. While unlikely to kill a dug-in target, a crucial suppression or disorder can allow you to close with your more effective weapons. Also don't forget smoke. While each mortar only has one round of smoke, it can be used to decrease the effectiveness of the AT guns at a critical time. Usually this scenario ends up with a vicious battle for the town at area III, with infantry from each side attempting to close-assault the other out of the town. Remember that the town at area II. does not count for victory conditions.